When given the opportunity to see one of the Forbes 30 under 30 members, we go for it! Alex Banayan, is an author, venture capitalist, and thought leader on millenial trends for business. 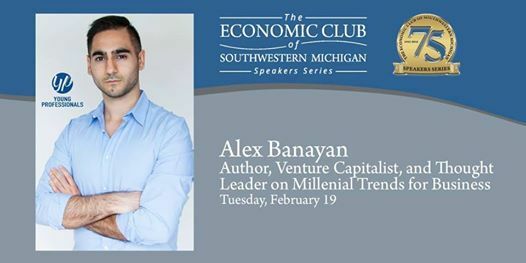 Every single one of the world’s most successful people share a common trait, people like Maya Angelou, Bill Gates, Mark Zuckerberg, and more… Join us for a pre-event mixer with The Econ Club of Southwest Michigan at The Mendel Center for their special YP guest speaker Alex Banayan. Elliott Berlin of Varnum Law speaking on the importance for entrepreneurs to build their business on a proper legal foundation and the opportunities for startups to recieve free legal serivce grants through Varnum Law’s MISpringboard program. Purchase YP Discounted tickets for Alex’s Econ Club presentation by CLICKING HERE!